The truth is that there are only a few steps to follow to enjoy our favorite food during the summer days. Forget he refrigerator. Find a cool place to store the ham. Then, the ideal temperature to consume it should always be between 70 and 76 F.
When you open the ham for the first time, use a strong knife to take away the first layers of skin and yellow fat. Once you get to the white fat, start using the ham knife (long and flexible) and save some thin slices of this fat to cover the exposed meat once you finish for the day. 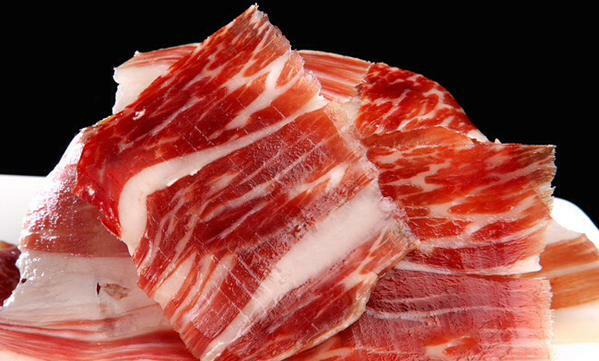 When carving the Ibérico ham, try to obtain bite size, thin slices with a good amount to fat. The fat of a good acorn-fed Ibérico ham (Jamón Ibérico de Bellota) is where all the aromas and flavors are. Eating this ham without fat is enjoying it only 50%. Make sure to enjoy your Jamón Ibérico de Bellota with a cool drink this summer. Try it with a cold beer, a glass of chilled champagnne or go for one of the best pairings for Jamón Ibérico: Sherry, specifically Fino or Manzanilla. Enjoy one of the finest pleasures of life this summer: A unique Jamón Ibérico de Bellota “Pata Negra” from Ibérico Club.